Abdullah Hukum LRT station is an elevated rapid transit station in Kuala Lumpur, Malaysia, forming part of the Kelana Jaya Line (formerly known as PUTRA). 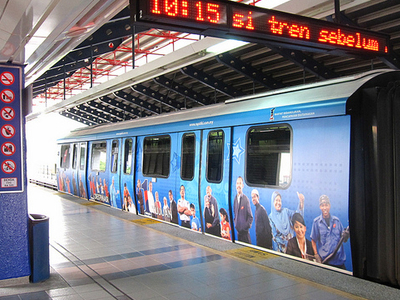 The station was opened on September 1, 1998, as part of the line's first segment encompassing 10 elevated stations between Kelana Jaya station and Pasar Seni station (excluding the KL Sentral station opened later), and the line's maintenance depot in Subang Valley (Malay: Lembah Subang). The station's layout is somewhat consistent with other elevated Kelana Jaya Line stations, and is alike the Bangsar station. The station has three levels: The access points at street level, and the ticket area and adjoining platforms on two elevated levels. All levels are linked via stairways, escalators and elevators designated for disabled passengers. 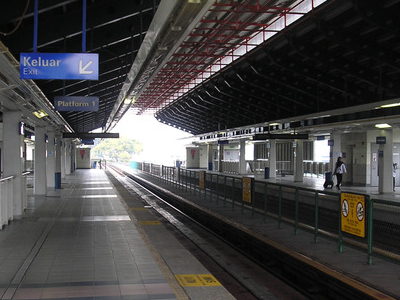 Here's the our members favorite photos of "Railway Stations near Bangsar and Midvalley". Upload your photo of Abdullah Hukum LRT Station!